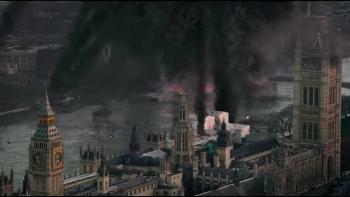 C’mon…a missed opportunity to play London Bridge is Falling Down or some variant in the trailer or film! A couple of undetermined years after the attack on the White House, once-disgraced agent Mike Banning (Gerard Butler) has been reinstalled as the head of President Asher’s (Aaron Eckart) security. A simple choice, really, being that Banning saved the world. But, Mike is contemplating resignation from his role, in order to spend more time with his wife (Radha Mitchell) and soon to be newborn. The unexpected death of the British Prime Minister requires the President to travel to London to pay respect to one of America’s most important allies. While there, all hell breaks loose even with massive security deployed, and it turns out that President Asher is the main target. London Has Fallen siege to a years-in-the-making terrorist attack, and it is up to Banning, once again, to protect the Commander in Chief in the face of overwhelming odds. 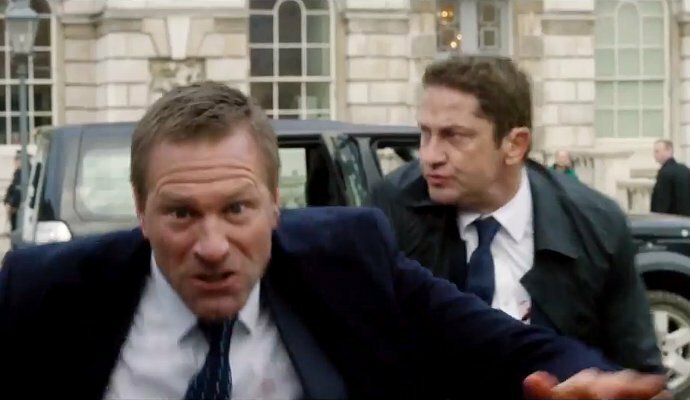 Something tells me that if the events of London Has Fallen were, heaven forbid, carried out with a possible future President in charge whose name is Donald Trump, it wouldn’t be a surprise to see a large chunk of the American population not care about whether he made it out alive. 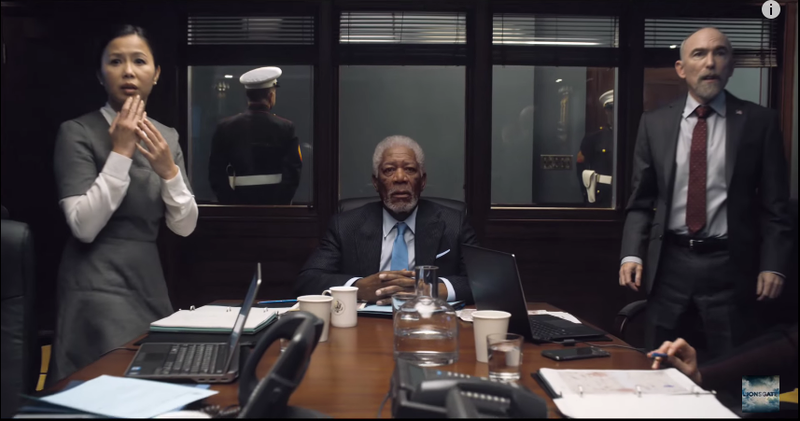 Real-life politics aside, London Has Fallen is the sequel few people had asked for to the surprise hit Olympus Has Fallen, but have received. The biggest positive is that this isn’t as bad as its trailer would indicate! With that said, this is very much in the vein of its predecessor, which is good and bad depending on the viewer’s appreciation with the first. Stepping into the director’s role in place of Antoine Fuqua is Babak Najari, who yours truly is unfamiliar with. 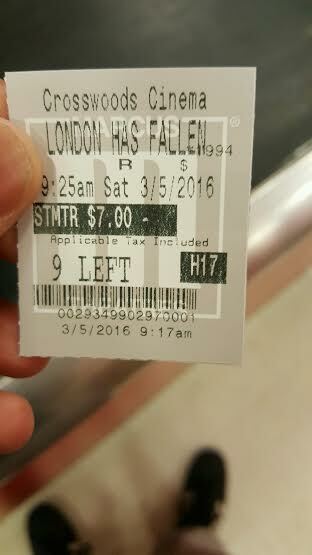 LHF is as a whole, better-directed than some other similar action movies. Thankfully, this is no Taken 3. Generally, Najari is solid, not spectacular, in his direction; he does manage to put together one to two standout action sequences, mainly the car chase that happens about a third of the way through, and some good hand-to-hand combat. I’d argue that the few one to two high points of London are higher and more memorable than the high points of Olympus. Similar to Olympus however, the CGI is just as bad and in some cases worse, be it an explosion, some helicopters flying, or even some digitized blood. It is just…shoddy, which can be said as well for some of the editing and set pieces. Whether it is a lack of budget, or a lack of skill, some of the second half suffers aesthetically due to an absence of light, which makes it hard to see what is happening. Just accept that Banning is inflicting damage because he doesn’t take any. And he inflicts a lot of gushy and violent damage. Notice I didn’t mention the plot aside from the intro. That’s because it is extremely straightforward, and nothing more than what it promises, which is the good guys coming after the bad guys for coming after their safety. If there is one key thing that London doesn’t get right which Olympus did, it is the feeling that comes at the end, that “Merica” feeling. However trivial that sounds, it existed in the first installment, and it is not found here despite efforts to have it present. This installment still has Gerard Butler, a star when he’s in an action movie (save Gods of Egypt, of course). He gets to do some impressive things, but works mainly because he is pretty likable. It isn’t a role that demands a lot, aside from looking like a badass, which Butler can do in spades. He, as well as Aaron Eckhart, seem to know that they are at the heart of an unbelievably cheesy feature, and have fun with it. Their bromance is the core of LHF, which allows the two to participate in some humor that doesn’t land always, but works sometimes because it is so unabashedly corny. The only place where you’ll find more corn is in a maize field in Iowa. The film also has a returning Morgan Freeman (doing Freeman things at this point), Radha Mitchell, Angela Bassett, Melissa Leo, and a new edition with Jackie Earle Haley. But, there isn’t anything for them to add to LHF aside from looking in a concerned fashion at the stuff going down in London. The bad guys have been seen various times over. Sequels, especially action ones, have been worse than London Has Fallen. Some may differ, but it really isn’t all that different from Olympus. It’s a brainless, semi-shoddy, yet bloody enjoyable (in places) actioner. Great review. The 1st one was disappointing enough, but I’ll skip the sequel, especially after reading this. I thought CGI was bad enough in original 😉 hehehe. The only redeeming quality was 90s acton vibe. You won’t miss much. The only thing I will say is that if you ever watch it on TV, it’ll be obviously edited lol! I didn’t hate but find it firmly average. It’s odd, the thing I don’t get is how LHF is so much lower on the RT scale than OHF. They are both the same movie! If you hated the first, save that well earned moolah (cause you and I have to pay for 99% of the movies we post about, LOL) and watch something else, bro. Thanks John. It’s pretty average overall, not sure if you like actions. Sorry I’ve missed reading your blog man 😦 I’ll be reading a whole bunch of your posts right now! It seems quite xenophobic from the trailers and your review just confirmed that it’s indeed mindless action that goes down that beaten path again. Nice review!